Very useful bag with a tri-fold, flip-open setup for rapid access to Medical Supplies. See Photo for pic of bag opened. Also comes with ALICE pack straps for ease of carrying in the field. 2 field dressing 11" sq. 4 6"x5" yds. confo. bdge. 2 first aid cream pkgs. Contents may vary but substitutions will be of GREATER value when necessary. Over 300 items! 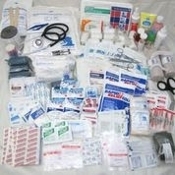 OD Nylon bag measures 16"x10"x13.5"
This is the medical kit you've been looking for!